Looks like the TrueDepth camera module on the Apple iPhone X is going to be expanded to other product categories as well. And this speculation comes from none other than KGI Securities analyst Ming-Chi Kuo, who has been pretty accurate with most of his predictions when it comes to Apple-related products. The Apple iPad Pro models to be released in 2018 will come with a TrueDepth Camera module and will also support Face ID for logging in, said KGI Securities analyst Ming-Chi Kuo to investors. According to a report in MacRumors, Kuo believes that the TrueDepth camera module addition to the iPad Pro is being done to have a consistent user experience with the iPhone X. This is also being seen as a move to develop that ecosystem. It will be limited to iPad Pros however, and will most likely not be seen on other iPads. According to Kuo, Android smartphone makers will also start researching on facial recognition technology instead of under-screen fingerprint recognition technology. It will take Android smartphone makers around 2.5 years to catch up with Apple's TrueDepth camera technology notes Kuo. "Because of this (TrueDepth camera coming to iPad Pros), we believe more developers will pay attention to TrueDepth Camera/ facial recognition related applications. We expect Apple's (US) major promotion of facial recognition related applications will encourage the Android camp to also dedicate more resources to developing hardware and facial recognition applications," said Kuo. 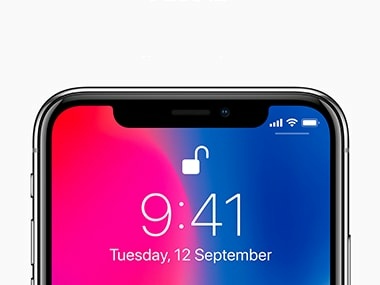 The Apple iPhone X is all set to launch in India on 3 November from Rs 89,000 onwards from Apple Authorised retailers. The Apple iPhone X is the first Apple smartphone to feature an edge-to-edge display, which is being called the Super Retina Display. It makes use of an OLED panel. It is a 5.8-inch display with a 2436 x 1125 pixel resolution which puts the pixel density at 458 PPI. The HDR display supports HDR10 and Dolby Vision standards and it is a True Tone display, that is also present on the iPhone 8 and iPhone 8 Plus that were also announced alongside the iPhone X. The display also supports 3D Touch and has a finger-resistant oleophobic coating. The phone will be available in space gray and silver colours and in 64 GB and 256 GB capacities. Considering there is no fingerprint sensor either on the iPhone X, Apple is relying completely on a new method of authentication — Face ID. The Face ID uses the TrueDepth camera module on the front camera of the phone to create a 3D mapped image of your face, using 30,000 dots to map your face, which can be later used to unlock the iPhone X or even make payments.